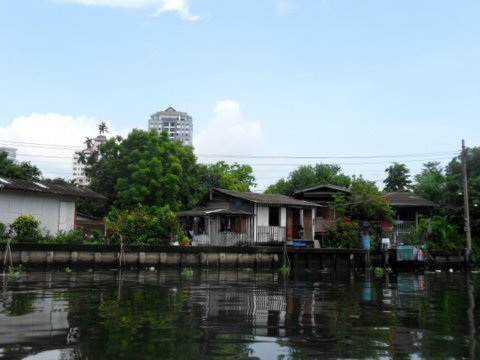 Phra Khanong canal or Khlong Phra Khanong is one of the remaining canals in Bangkok where the riverside communities still commute by boat in their daily lives. 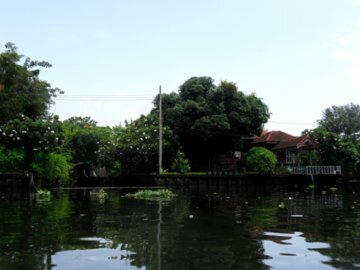 This peaceful and scenic canal is ideal for a self-guided tour to see a side of old Bangkok. 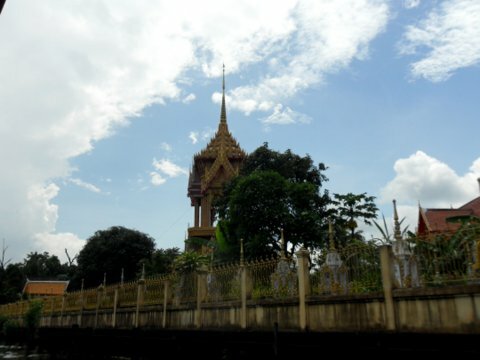 It is difficult to ascertain where the head waters of the Phra Khanong* are. 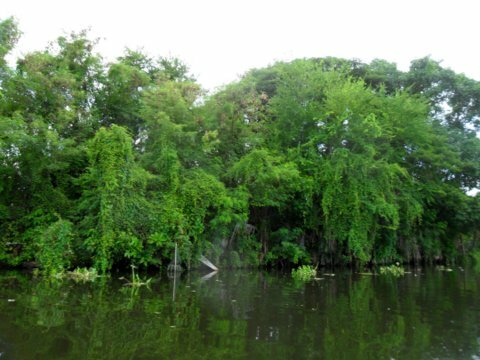 It is part of a very long waterway. 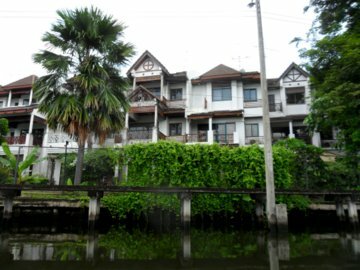 The Prawet Burirom canal that flows pass Hua Takhae market further to the east joins the Phra Khanong which eventually flows into the Chao Phraya River. For the route, please see map of the Phra Khanong canal. A whole network of other canals flow into the Phra Khanong making this waterway an important irrigation channel in eastern Bangkok. 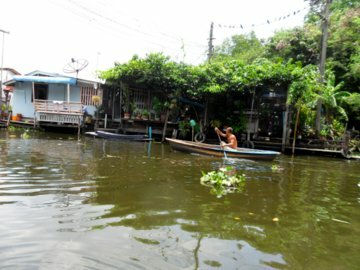 In late 2011 when the Phra Khanong broke its banks, the neighbouring areas in Sukhumvit Road were flooded. 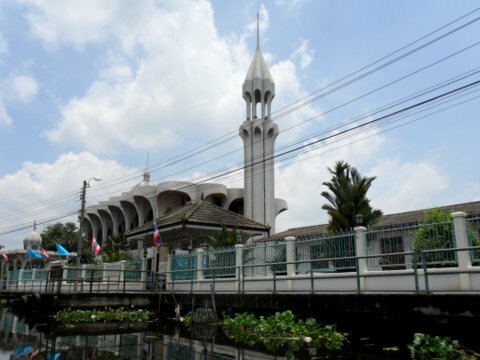 Phra Khanong is a very old area in Bangkok with several old communities of Buddhists and Muslims. 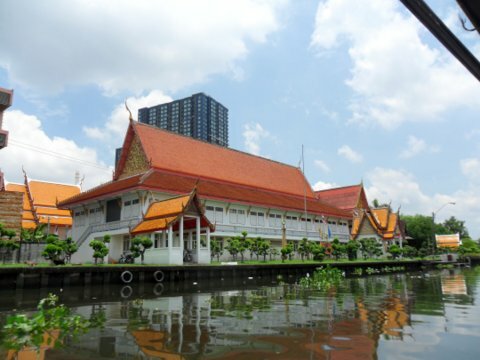 For more on the history of this area, please see Phra Khanong Museum. 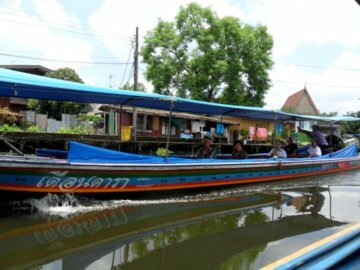 There is a long-tailed passenger boat that plies the Phra Khanong canal every day and it runs on a fixed route serving the waterside residents. 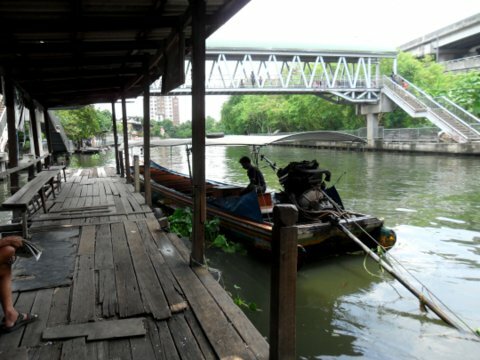 The boat service starts at the pier under the Phra Khanong Bridge and terminates at the pier under the bridge at Srinakharin Road, a distance of about eight kilometres. 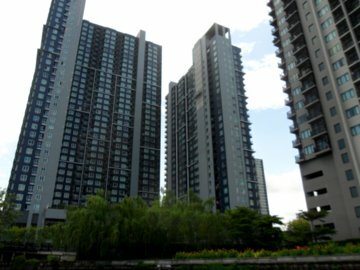 It’s a very scenic and leisurely boat ride that passes through beautiful greenery with old houses interspersed with new condominiums and bungalows along the way. 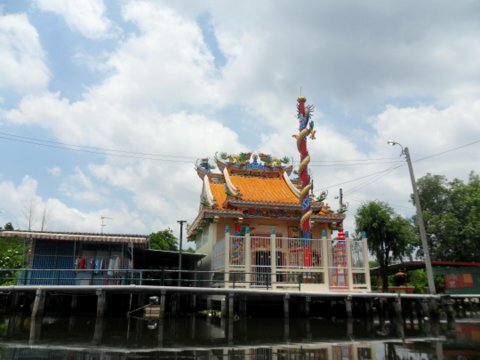 The boat ride passes seven temples, two mosques and a Chinese shrine. 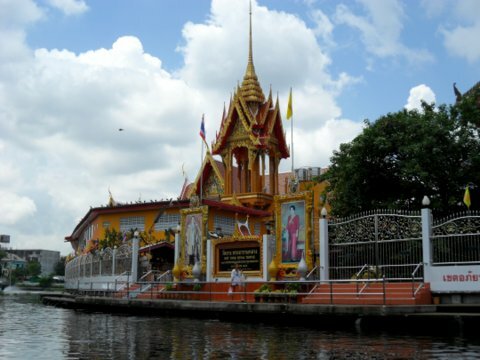 This is the best known temple along the Phra Khanong canal and home to the famous Mae Nak Shrine dedicated to the legendary female ghost, Mae Nak Phra Khanong. 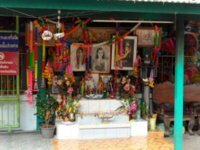 According to legend her spirit was exorcised by the abbot of Wat Mahabut, placed in an urn and thrown into this stretch of the Phra Khanong. 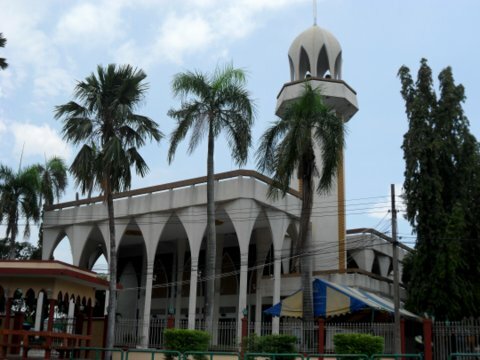 There are no fixed piers and passengers can get on or off at any the piers by the houses, temples or mosques. Most of my fellow passengers were on their way back from market with their groceries. It’s cheaper and faster travelling by boat. Sometimes, the boatman makes deliveries for some regular customers who are not even onboard! 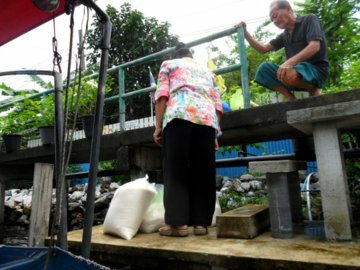 He stops by a pier near the customer’s home and drops off the supplies for collection. The canal boat tour takes one past old waterside communities in wooden houses where time seemed to have stood still. 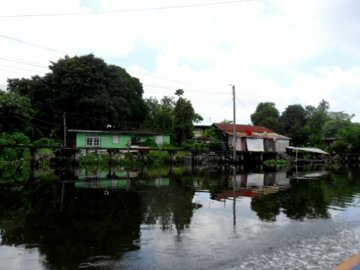 Residents still move around by boat, some on their own boats. Sights of fishermen casting their nets from boats are common along the way. Spanking new condominiums tower over the old wooden houses by the Phra Khanong canal. 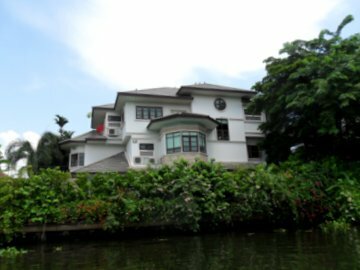 We passed huge mansions that were almost palaces before getting back to the tradition setting again. 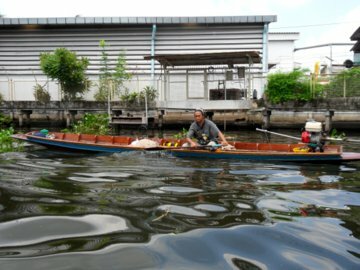 A boat ride along the Phra Khanong canal is an easy-going, peaceful and relaxing trip passing through scenes in stark contrasts; it’s one of the rare sights in Bangkok where traditional life still exists with modernity all around. 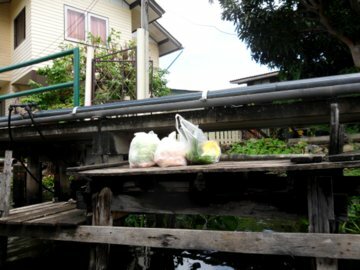 *Judging from the several meanders along its course, Phra Khanong canal looks more like a river and not a man-made canal. However it is called a canal even on the municipal notice boards at the Phra Khanong Bridge pier. 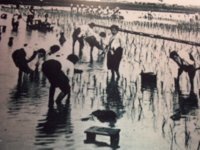 Initially I was under the misimpression that "khlong" meant a man-made canal. But the word is not limited to man-made canals. 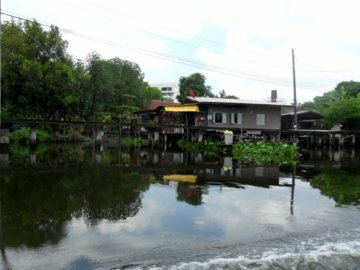 A natural but smaller waterway also can be called "khlong". Where to draw the line seems to be the tricky part. I must thank my friend Rungroj Nopnarathip for pointing this out to me. He has been invaluable in helping me translate some of the more difficult Thai words. Sometimes the simple words can be a problem too. Take a skytrain on the Sukhumvit line to E8 Phra Khanong station and get out at Exit 3. Walk towards the Phra Khanong market that’s before the bridge. The Phra Khanong pier is to the left of the highway bridge and under it. 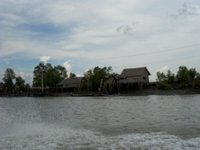 The boat service runs in the day and the fare is 10 baht for the entire journey. Fare is charged on a per trip basis. If you get off and board again, it’s counted as a new trip. There’s an extra 10 baht for bulky cargo like crates. 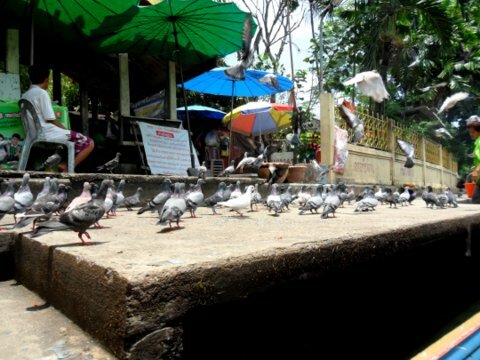 Here’s another self-guided tour that’s off the beaten track, Bang Khun Thien – an outing to Bangkok’s sea front. 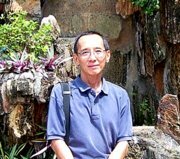 To return to Bangkok Guided Tours.